In 2012 the fourth plinth in London’s Trafalgar Square featured ‘Powerless Structures: Fig 101‘, a fabulous golden rocking horse and boy created by Elmgreen & Dragnet. The two artists were represented by the Victoria Miro Gallery, which approached us to create an interesting invitation for the party to celebrate the unveiling of the sculpture on the fourth plinth. The design was kept simple and pristine. 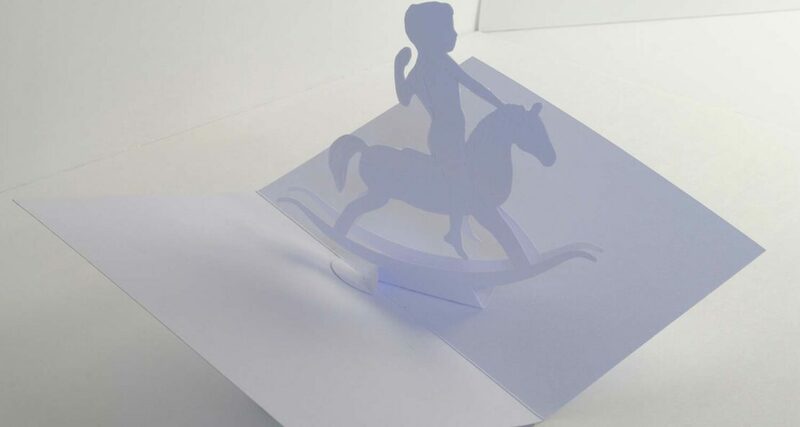 The rocking horse and boy were sculpture embossed on to beautiful white card which was then die-cut. The two sides of the sculpture embossed and die-cut rocking horse and boy were then carefully glued together and each card was hand-assembled to meet the exacting standards of the artists themselves. We used G F Smith Colorplan card for both the pop-up and the outer card, the outer card had a small logo and the title of the piece printed on the front. The sculpture was been extremely well received and we like to think that in its own way our card was too!